Not to be confused with Perineum. "Peritoneal" redirects here. It is not to be confused with Perineal or Peroneal. "Intraperitoneal" redirects here. For the intraperitoneal route of administration, see intraperitoneal injection. The peritoneum is one continuous sheet, forming two layers and a potential space between them: the peritoneal cavity. The outer layer, the parietal peritoneum, is attached to the abdominal wall and the pelvic walls. 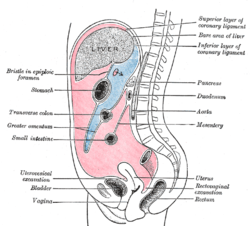 The tunica vaginalis, the serous membrane covering the male testis, is derived from the vaginal process, an outpouching of the parietal peritoneum. The inner layer, the visceral peritoneum, is wrapped around the visceral organs, located inside the intraperitoneal space for protection. It is thinner than the parietal peritoneum. The mesentery is a double layer of visceral peritoneum that attaches to the gastrointestinal tract. There are often blood vessels, nerves, and other structures between these layers. The space between these two layers is technically outside of the peritoneal sac, and thus not in the peritoneal cavity. The potential space between these two layers is the peritoneal cavity, filled with a small amount (about 50 mL) of slippery serous fluid that allows the two layers to slide freely over each other. Peritoneal folds are omenta, mesenteries and ligaments; they connect organs to each other or to the abdominal wall. There are two main regions of the peritoneal cavity, connected by the omental foramen. The greater sac, represented in red in the diagrams above. The lesser omentum (or gastrohepatic) is attached to the lesser curvature of the stomach and the liver. The greater omentum (or gastrocolic) hangs from the greater curve of the stomach and loops down in front of the intestines before curving back upwards to attach to the transverse colon. In effect it is draped in front of the intestines like an apron and may serve as an insulating or protective layer. The mesentery is the part of the peritoneum through which most abdominal organs are attached to the abdominal wall and supplied with blood and lymph vessels and nerves. Ventral mesentery Lesser omentum Lesser curvature of the stomach (and duodenum) Liver The right free margin-hepatic artery, portal vein, and bile duct,lymph nodes and the lymph vessels,hepatic plexus of nerve,all enclosed in perivascular fibrous sheath. Along the lesser curvature of the stomach-left and right gastric artery,gastric group of lymph nodes and lyphatics, branches from gastric nerve. The structures in the abdomen are classified as intraperitoneal, retroperitoneal or infraperitoneal depending on whether they are covered with visceral peritoneum and whether they are attached by mesenteries (mensentery, mesocolon). Structures that are intraperitoneal are generally mobile, while those that are retroperitoneal are relatively fixed in their location. Some structures, such as the kidneys, are "primarily retroperitoneal", while others such as the majority of the duodenum, are "secondarily retroperitoneal", meaning that structure developed intraperitoneally but lost its mesentery and thus became retroperitoneal. The peritoneum develops ultimately from the mesoderm of the trilaminar embryo. As the mesoderm differentiates, one region known as the lateral plate mesoderm splits to form two layers separated by an intraembryonic coelom. These two layers develop later into the visceral and parietal layers found in all serous cavities, including the peritoneum. As an embryo develops, the various abdominal organs grow into the abdominal cavity from structures in the abdominal wall. In this process they become enveloped in a layer of peritoneum. The growing organs "take their blood vessels with them" from the abdominal wall, and these blood vessels become covered by peritoneum, forming a mesentery. 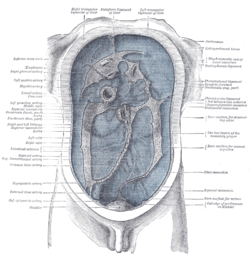 Peritoneal folds develop from the ventral and dorsal mesentery of the embryo. In one form of dialysis, called peritoneal dialysis, a glucose solution is sent through a tube into the peritoneal cavity. The fluid is left there for a prescribed amount of time to absorb waste products, and then removed through the tube. The reason for this effect is the high number of arteries and veins in the peritoneal cavity. Through the mechanism of diffusion, waste products are removed from the blood. Peritonitis is the inflammation of the peritoneum. It is more commonly associated to infection from a punctured organ of the abdominal cavity. It can also be provoked by the presence of fluids that produce chemical irritation, such as gastric acid or pancreatic juice. Peritonitis causes fever, tenderness, and pain in the abdominal area, which can be localized or diffuse. The treatment involves rehydration, administration of antibiotics, and surgical correction of the underlying cause. Mortality is higher in the elderly and if present for a prolonged time. Primary peritoneal cancer is a cancer of the cells lining the peritoneum. "Peritoneum" is derived from Greek περιτόναιον peritonaion "peritoneum, abdominal membrane" via Latin. In Greek, περί peri means "around," while τείνω teino means "to stretch"; thus, "peritoneum" means "stretched over." ^ "healthoracle.org Is For Sale" (PDF). healthoracle.org. Retrieved 14 April 2018. ^ Longo, D; Fauci, A; Kasper, D; Hauser, S; Jameson, J; Loscalzo, J (2012). Harrison's Principles of Internal Medicine (18th ed.). New York: McGraw-Hill. pp. 2518–2519. ISBN 978-0071748896. ^ a b "peritoneum - Origin and meaning of peritoneum by Online Etymology Dictionary". www.etymonline.com. Retrieved 14 April 2018. Wikimedia Commons has media related to Peritoneum.